Day three featured some of the best development companies the automotive world has to offer. Our first stop was at Swift Engineering, the team responsible for such works as the Mazda Furai and the Killer Bee, a fully autonomous aircraft. Swift has all the bases of product development covered from an extensive machine shop, a clean room for composites, an autoclave, and a half scale wind tunnel. After Swift came a visit to Metalcrafters, run by the Gaffoglio family. 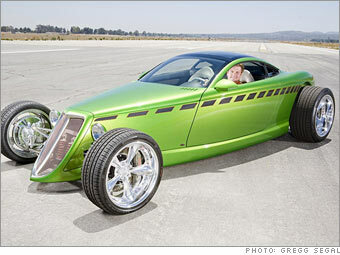 This is a world renowned product development and coach building firm with capabilities from milling full scale models in one of their three 5-axis mills, to producing DOT compliant glass (for which they also make the tooling), to after market grilles, funny car body layup, to building complete concept cars for large auto manufacturers and smaller designers like Chip Foose alike. Another shop that is well known for top-notch concept development is Aria. This was another larger facility with full scale modeling capability with several engineers and designers on staff to produce concepts from such clients as Panoz, BMW, Mitsubishi, Nissan, Mercedes, and Ford to name a few. We also visited Automotive Technology Group, headed by Steve Trindade, the former development engineer for the Saleen S7. ATG has paired with Dale Beever of Ideation Creation Group to offer not only the services listed of the shops above, but also a solid background in vehicle development for production - not just concept cars. As I was taking notes, this fact was worthy of bold, underlined text since we are in this not to just produce a prototype, but to mass produce the prototype, unlike some of the concepts the other shops produce. To see such a wide array of capabilities from suppliers of different levels was a definite benefit in determining who we should seek out for certain aspects of the prototype development as well as seeing what processes we will need to bring in house over time as our core competencies. Day four brought more of that knowledge as well as exploration of composite manufacturers, so more to come on that tomorrow. I'm completely jealous of your visit to Metalcrafters! Top notch stuff! Yeah, their shop is pretty impressive. They were milling out a car in full scale foam when we were there, which was really cool to see.